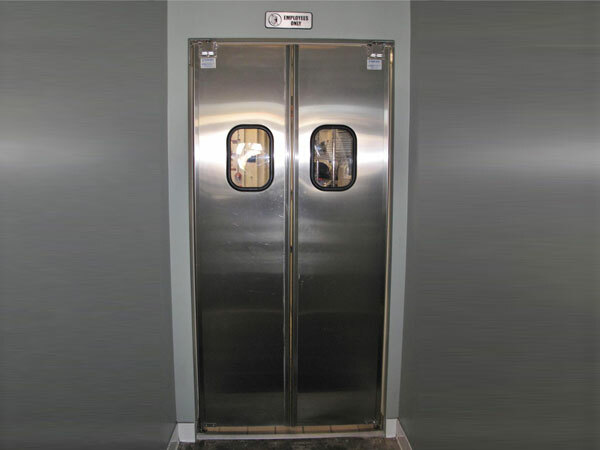 If you have a restaurant or business that requires traffic doors, it is important that you understand what kitchen doors are and how they’re used. Kitchen doors from Discount Commercial Doors are tailored to suit many different applications and markets. What is a Kitchen Door? A kitchen door (also known as a traffic door) is a double acting door that provides a barrier between two areas. This “barrier” can be visual, thermal, or both. “Double Acting” means that the door swings in either direction. Traffic doors are designed to be opened by impact. The type of traffic, the impact and the function that the door is to serve will help you to determine the product to be used. Traffic doors are an excellent choice for applications where a high volume of traffic exists and minimal infiltration is desired. While doing your research, you will come across different names that are used for kitchen doors such as: Impact Doors, Double Acting Doors, Bump Doors, Swinging Doors, Sheet Doors, Double Swinging Doors, Kitchen Doors. These are all the same and names are interchangeable. One type of kitchen door is called a flexible door. A Flexible Door is a traffic door that utilizes a single hinge at the top of the door. The advantage that the flexible door offers is it’s ability to handle abuse from traffic passing through the opening. There is no lower hinge on the door, and the panels will “flex” if wrapped around the corner, or if traffic passes partially through the opening and reverses direction. Impact doors significantly reduce energy consumption and compressor workload. Impact resistant doors extend product shelf life by maintaining a more consistent temperature inside walk-in coolers and freezers. Our Ruff Tuff V-Cam industrial swing doors are built to withstand the maximum punishment! 1 1/2 inches of pure muscle incorporating a heavy duty internal steel frame built for forklift and pallet jack traffic in warehouse and industrial applications. The Ruff Tuff II is the perfect Commercial Door System for Supermarkets, Restaurants, Warehouses, Offices and Retail applications. The Professional Appearance, it’s unique internal welded steel frame makes this door system a rugged, yet decorative choice with unequaled strength and durability. Ideal for High Walk Through, Light Pallet Jack and Forklift Traffic. The Ruff Tuff Doors are Truly Better Built Doors. The Pro Tuff Commercial swinging door systems will enhance the appearance of any decor. Using advanced polymers and engineering, we have created a rugged, attractive medium duty walk-through traffic door system. This door is widely used in Restaurants, Supermarkets, Office and Retail environments.